The following applications are listed as examples so as to give an idea of how our coatings and coating services can help you. Please contact us for more information. Our UV stable abrasion resistant coated Polycarbonate sheet is used for external lenses and windows. The anti-grime properties of our coating help keep these lenses and windows clean of dirt and grime. The coating performance can be gauged on our video. Commonly called bullet proof glass, the glass/plastic composite has an abrasion resistant coated plastic sheet on the interior to prevent splinters and spall from an impact on the glass from entering the vehicle cabin. Very high quality coated sheet is the order of the day. Polycarbonate is used extensively for LED lenses and covers but of course is very soft. 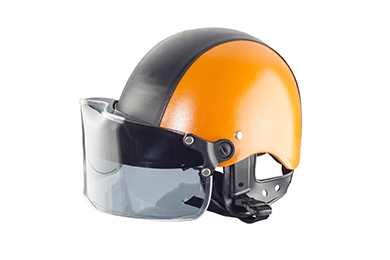 We coat them for abrasion, chemical and solvent resistance. The requirement was to provide chemical resistance and abrasion resistance for a high volume injection moulded gear knob motif that had been metallised to show the gear locations. Here the need was to improve light transmission and reduce grime build up as part of a safety development programme. Improve readability of external digital signage and provide some anti-graffiti resistance with a non-glare coated surface. Gold coating provides both light and heat protection to the wearer when handling or facing molten steel. Here the objective was to prevent misting up on the inside of the visor in use, thus giving the wearer an advantage over their competitors. Team GB used our coatings at the 2014 Sochi Winter Olympics. Where the need is for both anti-fog properties and abrasion resistance so the officer can see what is happening no matter what happens. Here the gold coated visor ensures the firefighter can see even when facing a fire. So the motorist can always see what the gauge is reading. Abrasion resistance and anti-fog coated plastic does away with heavy glass and demisting fans. Abrasion and solvent resistant coated Polycarbonate gives lightweight windows with perfect clarity and safety with anti-graffiti properties. Abrasion resistance and UV stability on 'piano black' pieces. Having designed a lightweight acrylic light guide for a new car, the manufacturer needed a chemical resistant coating to prevent degradation of the light guide through exposure to everyday car cleaning products, air fresheners etc. The coated polycarbonate housing could be placed anywhere on the pipeline so needs to be resistant to extreme temperature and UV ranges. The latest generation military gas masks, or respirators, use an optimised lens coated for anti-fog, chemical and abrasion resistance. Designed to increase light transmission, the UV stable abrasion resistant coating smooths out the minute imperfections within the surface of the moulded plastic headlamp cover.